Are the grey skies and cold days keeping you penned up inside more than usual? Are you spending too much time being a couch potato? Well, here’s an idea for you…do some self-care. You have no excuses. Really, none. You can actually DO something while you’re watching football or mindless reality TV shows that is GOOD for you. Your body (and mind) will thank you for crawling off the couch, on to the floor, and giving it a little love. In addition, a little gentle movement will help move some Qi, preventing stagnation and helping you to feel more calm and settled on a mental as well as physical level. Here are 6 of my favorite books for self-care and a brief description of each one. I always borrow books from the library before I commit to buying them to see if they resonate with me and provide me benefit. So try before you buy and see what you think for yourself before you simply take my word for it. This is my absolute GO TO book whenever I have unexplained pain and want to figure out what muscles might be causing or contributing to it and how to fix it myself – not with needles, but with my own hands. Great descriptions for the lay-person and very effective techniques to take charge of your own pain relief. Some techniques utilize tennis balls or the Thera-cane, but many just need your hands and a willingness to create a little discomfort to eliminate trigger points and relieve pain. It doesn’t always feel awesome when you’re digging in to your active trigger points, but the relief you get afterwards will be well worth it. 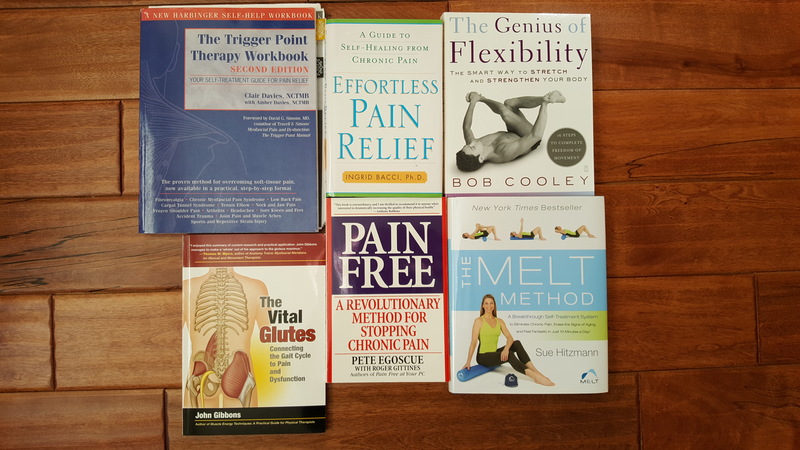 Description from Google Books is pretty perfect…”The most frequent causes of neuromuscular, joint, or skeletal pain can be traced to your lifestyle: unconscious habits that involve the way you breathe, stand, & move & the way you store physical & emotional stress in your tissues. This book includes clear, simple, & powerful self-help techniques for reducing & even eliminating pain. You can change your lifestyle habits, & eliminate your pain, by adopting body awareness techniques that eliminate tension. The book shows you how to release physical, mental, & emotional stresses through breathing techniques, to reduce consciously the effort & tension in your muscles, & to master & eliminate stressful emotions like fear & anger by learning to control the physical tensions that these feelings create.” A wonderful book that I continue to re-read periodically because it has so many bits of wisdom. I love this book because it not only has a great series of stretches, but Bob is a very down to Earth & relateable guy. He is genuine and real and looks at flexibility and stretching from a different perspective that I think can help get us out of our heads and into a fresh new space in the flexibility world. It lacks Western anatomical descriptions of what muscles you are working or stretching, but instead utilizes the Oriental meridian system, which I love and think is so useful to expand our understanding of how interconnected everything in the body really is. Sometimes we get too attached to breaking the body into individual parts & pieces as we do in Western medicine and this book eliminates that hang-up. Another great Google Books description – “John Gibbons looks at one of the most neglected areas of the body: the gluteal muscles. The Vital Glutes takes you on a fascinating journey of enlightenment, teaching the reader to recognize pain and dysfunctional patterns that arise from the gluteal muscles.” This book helped me to realize how weak and neglected my own gluteal muscles had become and how much that was factoring in to my low back and sacroiliac pain, so I highly recommend it if you have low back/hip/SI joint pain. Amazingly simple “exercises” that help the body reset and release its dysfunctional holding patterns. The “e-cises” in this book are simple but extremely effective and I often ‘prescribe’ them to my patients to help their healing process. They may seem too simple to do anything, but if you are consistent and patient, these “e-cises” will help even the most stubborn pain issues start to unravel. I am appreciating more and more that “less is more”. This book embodies that and will help you find a greater appreciation of how simple things can be extremely transformative and useful in reducing and eliminating pain. MELT stands for Myofascial Energetic Length Technique. Sue discusses the importance of the connective tissue and how to keep it supple and hydrated by using a soft foam roller, small balls, and a little time and self-care work. She has a lot of first hand experience that has contributed to her wisdom and her knowledge is very applicable to most of us and our every day lifestyle choices and habits. This is a great book for teaching you techniques to care for you fascia & connective tissue. These truly are just a handful of the many books on my bookshelf that I love, refer to, and draw from continuously. They are a great place to start if you are interested in learning more about your body, the pain cycle, how to add more self-care and maintenance in to your daily life, and how to reduce or eliminate pain. It is the beginning of a new year, and if you want to work towards a healthier happier ‘new you’, then learning some self-care techniques can be a step in the right direction. Learn to love and care for your body, it’s the only one you have, so treat it with kindness and compassion. Best wishes for a wonderful 2017.